Read the archived newsletter here! See the past winner posters here! Social influence is often instrumental for encouraging pro-social behavioral change in others. Who else are the most influential in our lives but our own children – with whom we want to maintain mutual love and respect? We call this the “Inconvenient Youth” effect, and it is our current focus with the Utah High School Clean Air Poster Contest (cleanaircontest.usu.edu). 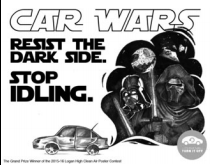 Now in its fourth year, we piloted the contest at Logan High in 2015 to engage teens learning to drive to understand the air pollution implications of their new driving privilege through a fun poster contest where participants could win desirable prizes donated by local businesses (merchandise, gift cards and cash). Posters have been funny, edgy, and reflecting teen values and pop culture. Winning posters have then been displayed throughout the community. What we’ve discovered, however, is that not only do teens learn driving strategies to help preserve air quality, such as refrain from idling and engage in trip-chaining and carpooling, but they also become clean air evangelists, influencing (pestering?) their parent, families and friends to take the same actions as well. For our expanded 2017 iteration of the contest involving over 400 teens in Cache Valley, we found approximately two-thirds of surveyed participants reported encouraging others to engage in clean air actions – even though we did not instruct them to do so – and 43% believed that they actually changed others’ behaviors for good. Can the Inconvenient Youth effect be harnessed and encouraged? That’s what we’re investigating next! We’ve published our current findings in the December 2017 issue of Sustainability: The Journal of Record (article available upon request). Specifically, we overview some strategies and future research for further harnessing the ‘Inconvenient Youth’ and how teens may be further empowered to foster clean air behaviors within their families and social networks.